I want to talk to you today about Google My Business. It is a crucial online, digital tool service from Google that is available to local businesses, true brick and mortar businesses, or service area businesses. You have to have a business in a location to claim a profile for that location, but when you do, it does unlock some powerful tools. This is something that is available for free to any business like those I mentioned above. If you do work out of your home and you don’t want to put your address in there, you can actually claim a service area of where you go out and serve your clients, but it does have to be in your community. You can’t be in Chicago and say, “Well, I’ve got customers in Dallas. I’d like to actually claim that.” You have to have it in the city where you have your actual business. I want to talk a little bit to those of you that have not claimed your profile, have not created it, or haven’t implemented this idea at all. So, what I want you to do is type into Google the name of your business, not your website, just the name of your business and maybe the city where your business is located. Generally speaking, there is a really good chance that you actually have a Google My Business profile that has been created in your business’s name because Google is constantly looking for information, addresses, phone numbers, things out there to present information when people are searching. So, don’t be surprised if you find one. Now, also, don’t be surprised if you had nothing to do with setting it up or you set it up five years ago in one of the various ways that Google allowed us to do these things called Google Places and Google Plus. Google Local, I think, was actually the original version. So, don’t be surprised if it’s out there. But under Google My Business, you really now want to make sure that you claim that thing and enhance it. I’m going to talk a little bit about how to do that and the first step really is to then verify that it is your listing. Now, if you’ve got that listing and you are familiar with this process, stay tuned because I’m going to talk about how to enhance it in ways that I don’t necessarily see everybody doing. But let’s go back to how you do this process. Frankly, if you just want to start from the very beginning, business.google.com is where you’ll go to find a Google My Business profile or to set up a Google My Business profile, but once you find it, if you’ve already claimed it, you should be able to log into business.google.com and do all the editing we’re going to talk about. But if you find that it’s not been verified, you’re going to have to go through a couple of steps and sometimes these are easier than others. The first step is if you find your profile and it says, “Is this your business,” that’s a really good sign that it has not been claimed. Click on yes, this is my business, and you will have a number of processes you might have to go through. They may have to mail you a postcard. You may be able to do it with an email or with a text. It depends on the state of your profile and how sure Google is about the information in that. Unfortunately, I can’t tell you exactly which one will be the one for you. Now, here’s another issue that we come across all the time. Don’t be surprised if you actually find duplicate listings. This again, I think, goes back to the days when this data was coming from Google Places and from Google Local and then Google Plus and sometimes, people just set up three or four Google Plus accounts because somebody left the organization and they decided they needed one and so they set another one up. So, don’t be surprised if you find duplicate listings and a lot of times, it might be a variation of the name or a different phone number or maybe you moved your business and so it has a different address. So, what you want to do is you want to find the one that is incorrect or that is certainly not right (maybe it doesn’t have the full information and so it’s the one you want to get rid of). So, what you want to do is you will typically find a tab that says “suggest and edit.” You want to click on that and you want to mark that location as permanently closed. I’m finding that Google wants to clean up that information and so if they can verify that that is accurate, they will close it within a week. If it was set up by somebody who no longer works for you or you don’t even really know who set it up, it’s going to take a little longer because they’re going to actually try to reach out to the email address that they have on file for that and if they don’t get a response, they will go ahead and make that change. So, cleaning up that duplicate may be your first step. So, claim or create, verify that it’s your listing, and then see if you can clean up duplicates. Unfortunately, that’s the first step. Now, let’s go through the profile itself. The most important information is the name of your business, address, and phone number. Don’t get cute with this. I mean, in some cases, people will try to put keywords at the end of their name and all kinds of goofy things that somebody told them to get so they’d benefit from it. Don’t do it. Make the business the name of your business as you want your customers to see it, the address, make it consistent with what you have on your website, and the phone number, make it consistent with what you have on your website as well. Make sure that those things are accurate. This might be a good time to look at your website as well. Have you got that wrong on your website? Don’t laugh. I find it all the time. So, let’s make sure that those are right and the same as your website. The next really important element is something they call “category” and particularly, if you have not claimed your Google My Business profile, Google will take a guess at what they think it is based on your name, based on a description, based on things they find out there on the web. Don’t take their advice necessarily. They may or may not have that right. Your primary category should be the primary category that you want to rank for when somebody goes out there searching. So, if you are, for example, a remodeling contractor, then you don’t want your primary one to be “construction company” and there’s a really good chance it is. So, they actually have categories for “remodeling contractor.” I think they even have a category for kitchen remodeling. So, you want to make sure that you get as specific as possible with that primary category. The good news is you will also get to choose some secondary categories and so I definitely recommend that you do that as well and again, don’t get cute here. Make sure they really are categories related to your business. Some of the other information like hours and things are pretty straightforward. There is an opportunity for you to upload images and this is something that Google tracks in their insights and so I do think it’s a ranking factor. Also, particularly on a mobile device, it’s a good trust building and content element. So, upload 8 or 10 photos of your products, of your business, of your people. It doesn’t really matter what it is, but make sure that you have some pretty good representative images that you upload. So, that’s the setting up of the profile and again, after you claim it and after you do some things to enhance it, there’s really not a whole lot more to that. 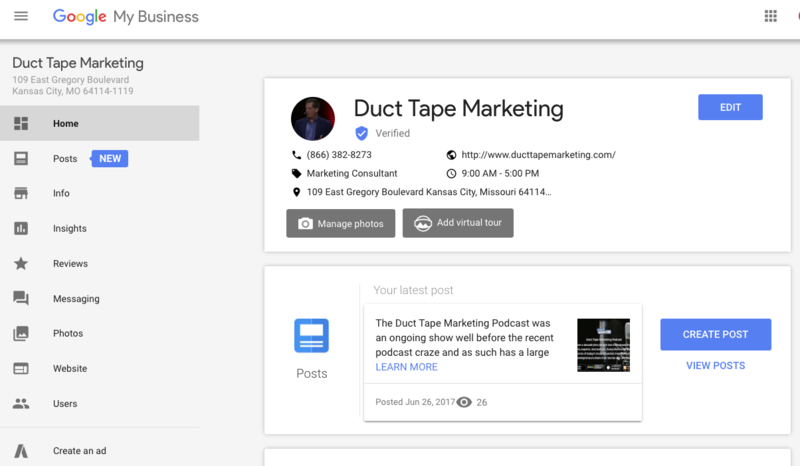 Another thing that they just added is that you can actually, if you’re logged into your Google account, and you do a search for your business, they have now started showing an editable version of your Google My Business profile. Nobody else can see that, but you’ll be able to see it and what’s really nice about that is that you can actually respond to reviews right in there. You can make changes. You can see what statistical data they’re now sharing, and I’m going to talk a little more about that, but that’s another way to actually access your Google My Business profile that is fairly new. 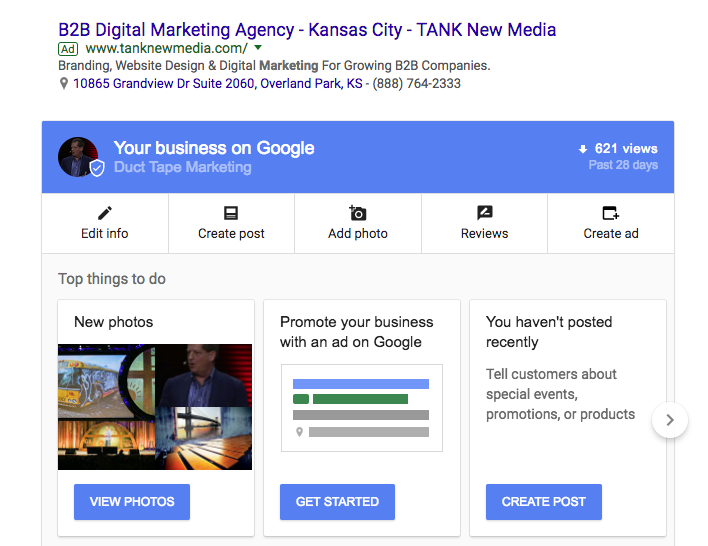 I want to go over a couple of the attributes of your Google My Business profile that when you sign in to business.google, you’ll have these options available and some of them are becoming pretty potent. I think it’s indicative of the fact that Google is really investing in Google My Business and adding some very interesting new features. I think it’s really a sign that this is a key component for them, which to me marks the reason for actually really getting involved in understanding your Google My Business profile and viewing it frequently rather than just set it and forget it. When you log in, you will notice “Posts” along the left side panel and this is a new feature I think you should play with. There is some indication that this is actually helping people rank. So, maybe you have a special coming up or maybe you have a new product or a workshop that you’re holding, it just allows you to put that information in there and you can set when it expires. 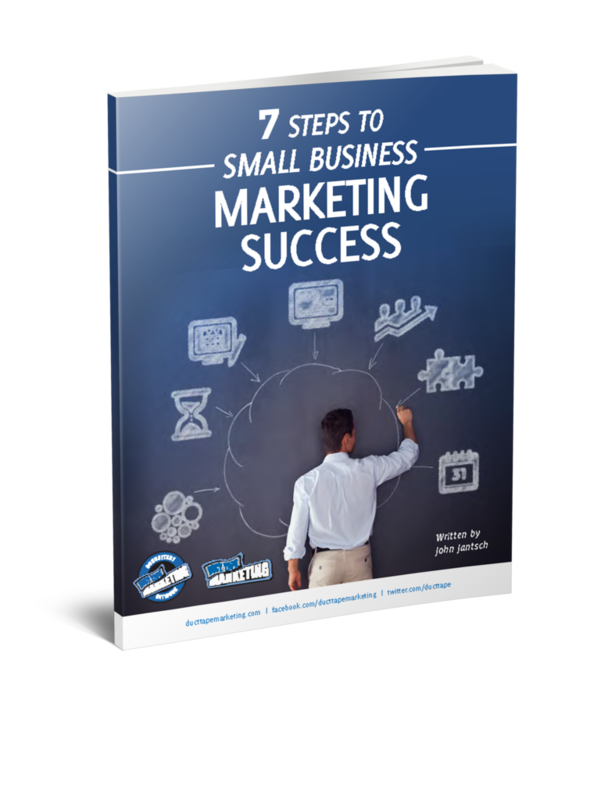 People are finding that they are getting traffic from these posts because you can also put a link to your workshop sign up or something like that. So, I think that it is worth spending a little bit of time to go in and enhance that and add those posts on a routine basis. Another tool is called Insights and this will give you a little bit of information on how many times your profile is showing up in search or in maps and what people are doing. Are they calling you? Are they clicking on it? Are they looking for driving directions? All the things that people can do and do frequently, particularly on mobile devices. It’s not like in analytics where you can compare one quarter to the next quarter or something unless you take that data and put it in a spreadsheet. But it is useful to look at. This is also a place where you can see not only your reviews but reply to your reviews and frankly, replying to every one of your reviews. Getting reviews, of course, is extremely, extremely important. Replying to reviews I think can be very important as well and this is for both good reviews and bad reviews. Bad reviews, of course, because it gives you an opportunity to tell your side of the story, if you will, or maybe state the facts as only you can, but I think when you respond to five-star reviews as well, I think it does a couple of things. First off, that person that gave you the review is going to get a notice and, quite frankly, probably appreciate that you saw that and replied. But it’s also another opportunity for you to show a personal side of your business. I work with an assisted living facility and they will frequently get glowing reviews of how well they have cared for somebody’s mother or father. To have the owner go in there and make a comment or a personal anecdote about that person and something that he remembered I think is tremendous content and over time is really great social proof. Another element I want to talk about is messaging. What they’ll ask you to do is connect that to a phone that can receive text. So, it has to be a mobile device that not only can receive text, but does, and that you can respond with. If you’re in the right kind of business, this could be a great leg up because a lot of times when people are searching out there on Google, they are trying to solve something. They want to hire somebody right now to do something and instead of sending an email or even picking up the phone, because a lot of people don’t like to do that, if they can text right from their browser window and they can get a response from you immediately, you might win the deal. If you’re the kind of business that books appointments, they’re now actually making that an option right off of your Google My Business page. Again, you have to integrate it with one of the booking kind of services that they work with. There’s about a dozen that are on there currently, so that might be an option if you’re a hair salon or a massage facility or something of that nature. I’m not recommending this for everyone, but they are actually now adding a platform where you can build a Google website. Essentially, it’ll just be a very simple landing page but they’ve got a couple of tools on there to make it pretty and add photos and drag and drop some things. So, if you’ve been living on your Facebook page and you don’t have a full website, which is certainly what we recommend, it could be an option for you as well. 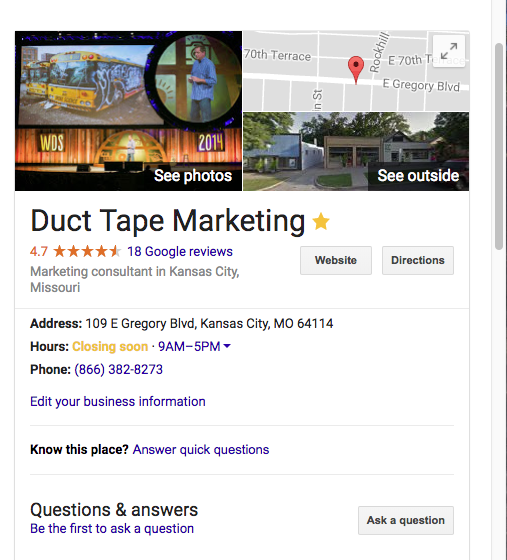 So, that’s really all I wanted to cover today on Google My Business, but this is really a key ranking factor for local businesses and it’s probably the primary building block these days for a local business. For example, when you see those businesses that show up in the maps listing when somebody searches hair salon near me, you can’t show up in that unless you have a profile that you have claimed, that you’ve optimized and obviously, getting things like reviews, and frequently adding posts, and making sure that the information is accurate is how you’re going to show up. That’s one of the pieces of the puzzle. There are of course many others, but that’s the one I wanted to cover today.